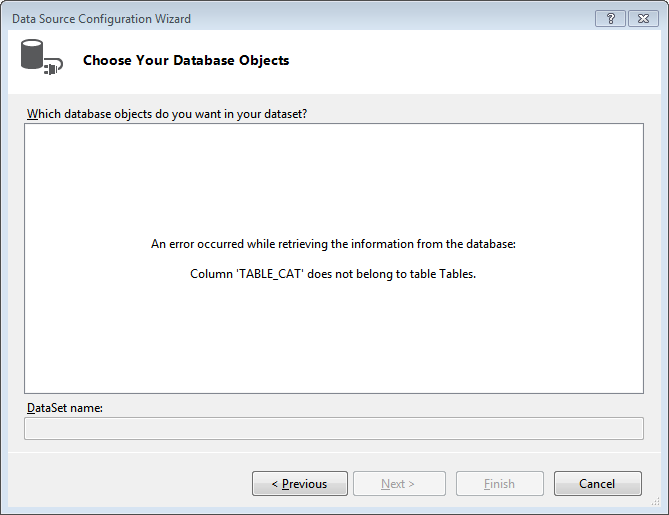 "An error occurred while retrieving the information from the database: Column 'TABLE_CAT' does not belong to table Tables." We unchecked the box on the server to run 2.1 ODBC compatibility. The test connection works, and I can access the data using QRemote on my client machine, but I am not able to get this database to connect to Visual Studio. Please query table directly instead of loading tables. I get this message trying to configure a DataSource. I cannot access any info using VS 2015 and VB. Perhaps a more detailed 'Solution'? You need to query wizard & write query manually instead of loading tables.